The Harkin Institute for Public Policy & Citizen Engagement and Drake University are excited to announce plans for a new home for The Harkin Institute on the Drake campus. The building, to be located near the southwest corner of 28th Street and University Ave., will serve as a model of universal design and provide much-needed space for Institute staff, researchers, and programming as the organization continues to grow. “The Institute has had a local, national, and international presence in its short lifetime and we are excited for the Harkin Institute’s physical space to match its caliber of programming, research, and outreach,” said Senator Tom Harkin (retired). The approximately $8 million project will be funded through private donations, of which $6.6 million has been raised. 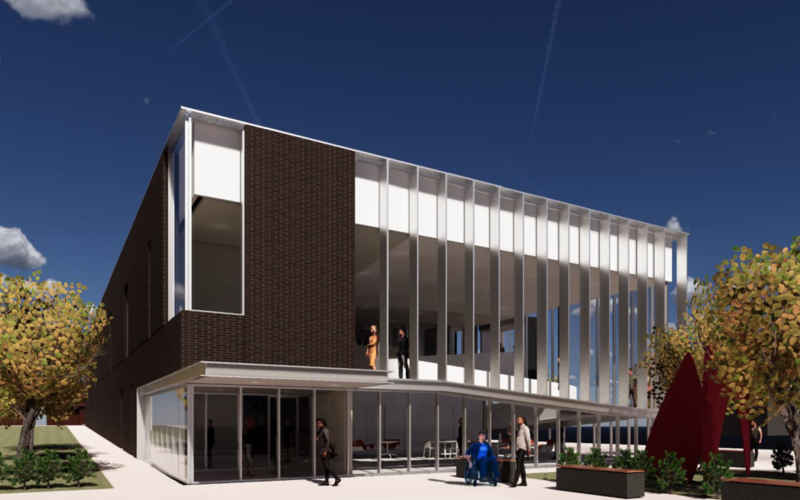 A two-story building of approximately 16,000 square feet will allow the Institute to provide more programming for Drake students and members of the community, in addition to housing the Institute’s staff. The Harkin Institute was established at Drake University in 2013 and has grown substantially in the past six years, in both staff and programming. Institute events have attracted more than 10,000 attendees during that time, and this school year alone, the Harkin Institute will host more than a dozen public events. The Institute staff has also grown to include approximately 15 undergraduate students each semester and five research fellows conducting important work in the areas of labor and employment, wellness and nutrition and health of people with disabilities. “The Institute’s new home on the Drake campus will enhance our ability to conduct a robust research agenda and to expand our engagement with Drake community members, Iowans, and individuals throughout the country and the world.” said Marsha Ternus, chairperson of The Harkin Institute National Advisory Council. The Harkin Institute’s National Advisory Council has played an integral role in the planning of and fundraising for the building. Members include Ternus, Charlie Cook, Angela Franklin, Michael Gartner, Ruth Harkin, Jim Hubbell, Rachel McLean, Sally Pederson, and Steve Roberts. As part of that planning, the National Advisory Council created a building committee comprised of Ruth Harkin, Ternus, Hubbell, Gartner, McLean and R.W. Nelson. The Harkin Institute for Public Policy & Citizen Engagement at Drake University exists to inform citizens, inspire creative cooperation, and catalyze change on issues of social justice, fairness, and opportunity. Founded on the premise that good public policy is best achieved when policymakers have access to high quality information, political processes are open and well-understood, and citizens are informed and active participants, The Harkin Institute offers programming, experiences, research, and connectivity focused on the areas that defined Senator Harkin’s career: labor and employment, people with disabilities, retirement security, and wellness and nutrition.